The Real Estate Database (RED) is a property search engine that returns results by quering from a network of several real estate websites which are linked together, The aim of the RED is to interlink all real estate websites so as to create the largest pool of properties in one place, the RED can also be referred to as a Multiple Listing Database (MLD) because it lists properties from a multiple real estate websites. 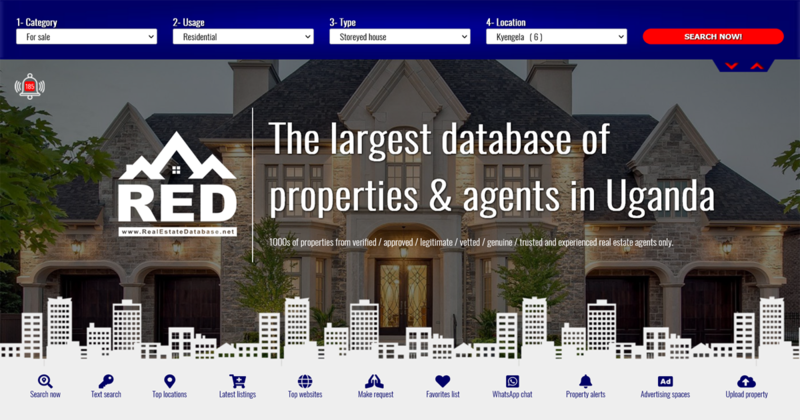 When you search the RED you get results from several sources including: Agents, Brokers, Developers, Property Managers and Home owners, all these sources must already have their websites linked to the database if the properties they own are to be listed. The RED therefore returns all the best results from multiple top real estate websites so that you find what you’re looking for faster. Each real estate website that is linked to the RED has its own properties and each will return search results. The RED looks at all of them, decides which results are most relevant to your search, and reveals them to you. In the end, you get a list of results more complete than any other online source. This time saving philosophy of a property search engine is so important that it has attracted large amount of traffic from house hunters who need variety. What the RED does is that it compiles all the best results in one easy-to-access place. Different Real Estate Agents, Brokers [Realtors] and Developers can register and then upload/post properties (for sale or rent) directly to this website and to their own websites simultaneously. House hunters can easily search for houses of their choice before they get into contact with the respective Brokers/Agents; this means that every real estate agent/broker can easily upload his or her own properties with images directly to our website regardless of where s/he is located [office, internet cafe, home, hotel, Airport, etc]. So! this website is simply a "property search engine" that is intended to "Enhance the agent-client relationship". We are the nation's leading "Real Estate Search Engine" and our investment in this hi-tech website has achieved the aim of providing a wide variety of houses for thousands of families and individuals that have less time to move around searching for a new property. All properties you will see on this website are uploaded by several real estate Agents and Brokers (Realtors) who have registered with us as members. if you are a landlord then please visit the Landlords page and contact any of our member agents; they will upload your property into our database. If you are an agent then please visit the agents page to register and upload your properties. It is an easy to use website for both house-hunters and registered members/realtors. We realized that "one of the biggest problems faced by real estate firms is the lack of ability and capacity to instantly update their own websites with new properties; especially if they have to edit the images". we have completely sorted that problem by creating a website that is updated/edited directly by the agent/broker without the help of a third party; and no need for any other software to resize/optimize images because the website does that automatically; and then displays the new properties instantly. Our mission is "to provide the most trusted Real Estate information and tools to support the agent-client relationship", and because properties are from many real estate agents; the website has a very wide selection of houses for Rent/Sale with descriptive information, color photos, agents details, property specifications, house descriptions, plus prices.. Whether its your first-time to this website or you are already a member; this is a great place to begin the search process. We have made everything available to you 24/7 and only a click away. We consider our list of clients as our pride and joy, as they have benefited from our skills, strategic thinking and user-centered design. Please see below some of the clients and websites that we have handled from information gathering, to design and hosting plus testing to implementation and launch. On behalf of all members and everyone at Zillion Technologies, I would like to thank you for choosing us to help you with your real estate needs. If you have any suggestions on how we can create an even better experience, or if you just want to share a real estate story with us, please contact us . We look forward to seeing you in the future on our website and in our offices. "You can now move from house to house using your mouse".